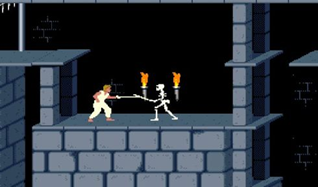 Jordan Mechner, the creator of the original 1989 state-of-the-art animation game Prince of Persia, has recently released the videos he took of his brother that he used for the animations in the game. When this game was released, it really took animations on the PC to a new level. For those that remember playing the game, I'm sure you'll recognize the moves performed in the video—especially his brother "struggling" to get up the wall. It's pretty impressive to see the original footage that lead to the ground breaking animation. It's basically the birth of motion capture in video games. Holy cow! That brought back some memories. Jordan Mechner is a genius. Let's hope he still has home movies for Karateka! Have you tried the prince or persia classic remake ? its quite fun.